On the job, fixing roof trusses. Set up inside a room. The Hook on Scaffold is easy to use scaffolding that saves lives and prevents serious injuries. Designed with the tradesman in mind, Hook on Scaffold is a cost effective and light weight accessory for most trades and a winner in section (Best Solution to an Identified Workplace Health and Safety Issue) of the ACT Workcover Occupational Health & Safety Awards 2005 and a finalist in the National Awards. 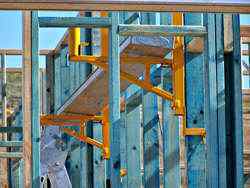 Roof trusses, floor joists in two storey buildings and fascia boards; Guttering and tie down strips or nailing cyclone clips. The Hook on Scaffold has been designed for the safety of tradesmen/apprentices. The Hook on Scaffold replaces the traditional scaffold by being attached to the house/building frame, negating the need for precarious scaffolding legs. The Hook on Scaffold is at least six times as wide as the top plate, enhancing the safety of tradesmen. The Hook on Scaffold, through providing greater maneuverability, enables tradesmen to work at hip height, assisting in the prevention of back injury through bending at the waist to secure trusses to buildings. Tradesmen are protected from icy top plates in winter months as they will have a support structure two planks wide to freely walk on. 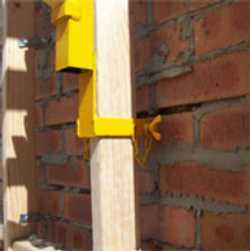 The Hook on Scaffold has been stress and weight tested by the University of New South Wales. The Hook on Scaffold uses a multi-height support arm which allows tradesmen to use the one product regardless of whether they are working at 2.7m or 2.4m. The working height of the tradesmen will be 1.8m from the ground. 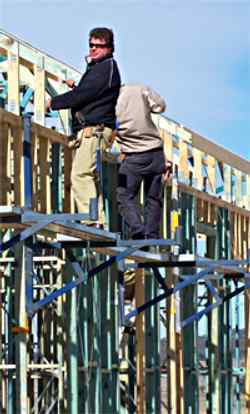 Thus allows the tradesmen to comply with safety regulations without the added expense of harnesses or rails. However, if the unit is taken above this height restriction, there is a capacity to install rails securely to the Hook on Scaffold. It can be used in rooms where floor boards are not yet installed. Most builders would only require two or three sets. By using two sets the span would roughly be nine metres joined in the middle by a plank joiner. A safety rail is in production and will be able to be used on both the large hook on arm and the small hook on arm. Here's a link to the Hook on Scaffold website for more details. When I think about some of the precarious scaffold set ups that I have worked on over the years, I shudder. Every one of them an accident waiting to happen. Times have changed and rightly so, we are all more safety conscious now, but the temptation is still there on smaller jobs for guys to cut corners. I can see anyone who has a set of these brackets will find many, many uses for them.